Women traditionally carry heavy water containers on their heads to collect water for daily use. Ma Masingita Maluleka in Limpopo now collects her water with a Hippo Roller and it changed her life for the better. “Sometimes, when we can’t borrow a wheelbarrow, we carry the water containers on our heads,” says Ma Masingita Maluleka. The water containers she’s referring to are 20 litre (roughly 5 gallons) containers full of water, needed to supply the day care centre she runs, with fresh water. Ma Maluleka isn’t in a unique position – many households in Northern Limpopo, located in the far-northern corner of South Africa, don’t have running water and rely on communal taps located in central points in their villages. Water is sold for a small fee and transported by wheelbarrow or carried, and often this task is left to the women and children. Collecting water is thus an essential activity in everyday life in Northern Limpopo, and whether or not it is overly physically burdensome and time consuming is immaterial. Going back to Ma Maluleka’s story – if you’re running a day care centre for anything from 40 to 90 children, you’re going to need a lot of water. This means many trips to the communal tap. A full wheelbarrow load of water weighs around 60 kilograms, which is roughly the weight of a medium-sized person. Added to this is the fact that Ma Maluleka and many others like her running day care centres are typically older women. In short, supplying a day care centre with an adequate supply of fresh water is time-consuming and laborious work. 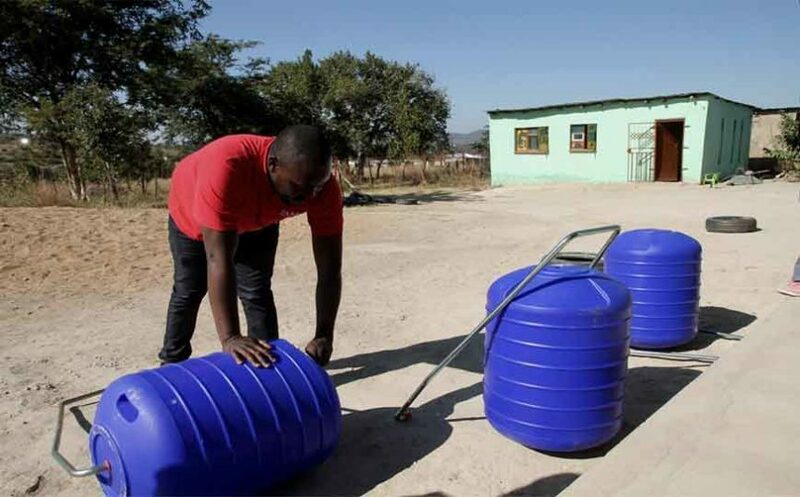 When the NGO JAM SA learnt about Hippo Roller, a 90-liter drum with a removable handle that makes water collection much less cumbersome, Ma Maluleka and others running day care centres in Northern Limpopo came to mind. JAM SA’s field workers in Northern Limpopo knew of many day care centre facilitators who spent too much time and effort collecting water, and Hippo Roller would help ease this burden. Soon, a crowdfunding campaign was launched on Different.org, and just over R100,000 was raised for the distribution of 60 Hippo Rollers to day care centres in Northern Limpopo. At first, JAM SA field workers and the Hippo Roller team distributed some of the Hippo Rollers. Day care centre facilitators gathered at pre-arranged points, where they were given a short demonstration of the Hippo Roller by JAM SA field worker Gideon Mufamadi. In the following weeks, the JAM SA field workers continued to distribute the remaining Hippo Rollers to day care facilitators in Northern Limpopo, enabling them to more easily provide fresh and adequate water supply to the children they have in their care. Original article appeared on the JAM SA website.